IFA 2011: Panasonic plans 'larger, smarter' LCD and plasma TVs | What Hi-Fi? Panasonic is to launch larger LED-backlit TVs in 2012, but remains committed to its plasma range, which should itself see larger-still sets. The company is also ramping up its smart TV involvement by rebranding internet-connected VIERA TVs as 'Smart VIERA', and formally introducing its free and paid-for VIERA Connect Market apps and shopping services on its VIERA Connect-capable TVs. 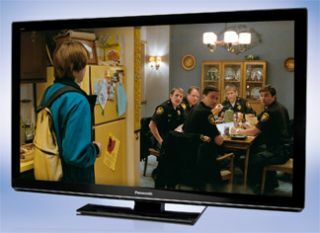 Panasonic says its 2012 sets will have 'no size limit' and offer ultra-fast response times, whether they are LED-backlit LCD or plasma based. While the current Panasonic VIERA range has little overlap between smaller LCD sets and larger plasma models, next year's line-up will see much larger LED-backlit TVs introduced, plus the biggest-yet consumer plasmas. Meanwhile, the company’s long-running 'digital hearth' concept - where the TV is the intelligent hub of each home - is ramping up with further smart TV offerings. This was demonstrated in a range of ways - from buying a new pair of 3D glasses from the shopping app, to a live Twitter feed, and multi-player gaming. Details have emerged, too, of Panasonic’s involvement in the London 2012 Olympics. It will provide the camera technology to enable 10 hours of live 3D content to be broadcast every day of next year's Games. This will cover more than 12 sports, some of which will be shown live in 3D for the first time. We'll bring you all the product details and release dates as soon as we can get them - stay tuned to our News channel for all the unfolding IFA action.